We have a Christmas Eve brunch at our house this year with BIL, SIL and Niece. Nice relaxed way to enjoy some family Christmas cheer. So here is my Christmas Eve Brunch for 7. Soak muesli overnight in apple juice. Defrost berries overnight if using frozen (which I did). 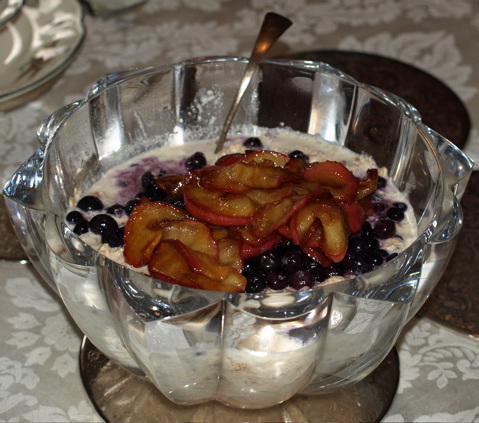 Gently stir through milk, cream, yoghurt, honey, vanilla & berries. Thinly slice apples and saute in butter, maple syrup and cinnamon until golden. Serve on top of muesli. 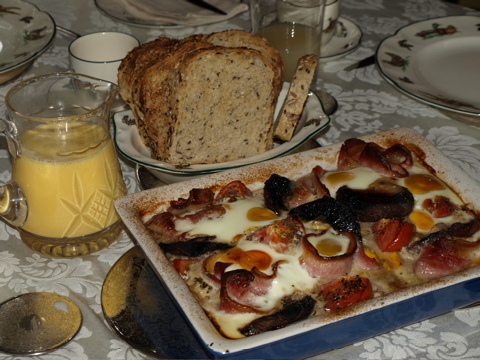 An all in one cooked breakfast of lamb and mint sausages, pork sausages, free range bacon, tomato, large swiss brown mushrooms, organic eggs served on nice fresh sour dough and topped with hollandaise (of course made in the thermomix). I prefer my eggs poached but I really wanted a good hearty brunch that would look after itself so I could enjoy family. Oven baking seemed a reasonable compromise between poaching and frying. There should have been blanched asparagus on top but I got all caught up in the excitement of finding out my SIL is in labour and forgot about it. C’est la vie. 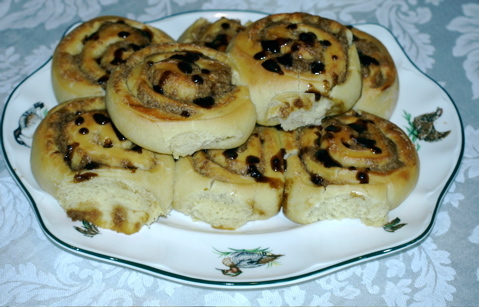 And to finish off the feast, tea, coffee and cinnamon rolls. Recipe looks good, I think I may try it in the fall. We don’t like to run the oven in the summer.